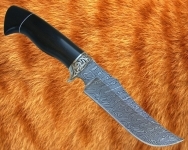 Damascus steel is a type of steel with visible non-uniformity in the form of a pattern on a blade surface. 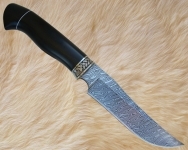 Damascus steel by forge and forge welding of several brands staly, such as У8 (carbon steel), ШХ15 (ball bearing steel), 65Г (spring steel) is made. 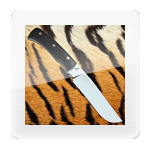 These steel grades have good technical characteristics, and in a combination with each other yield excellent result in the form of Damascus steel. 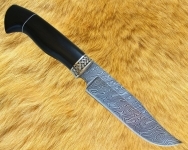 On variety of a figure of Damascus steel, it can be separated on some main types: twisted Damascus, fragmentary Damascus, cut Damascus, edge Damascus, mozaychaty Damascus. 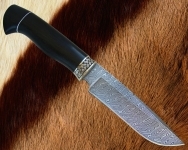 Figures (patterns) of Damascus depend on how the smith will add and will twist the collected layers from above-mentioned brands of the staly. 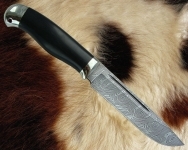 The advantage of Damascus steel is its ability long time to hold sharpening. 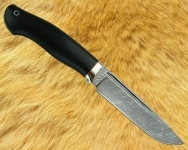 Due to properties welded staly, Damascus has the high hardness and rather low brittleness. 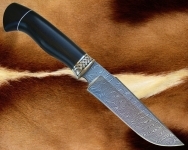 Lack of Damascus is that it very quickly rusts, but it is removed by smearing of a surface of a blade by fat or vegetable oil. As a whole - excellent steel, with excellent cutting properties and wear resistances.